Beautiful Texas style ranchette. Built in 2005, ultra custom home on 6 acres m/l with heated in ground pool plus hot tub. Home features large den with vaulted/wood ceiling, fireplace, wood floors, custom wall finish, wall of windows looks onto large back porch. Den open to rustic style kitchen with custom amenities, gas stove, breakfast bar, island, oversized refrigerator, farm sink etc. Breakfast nook and formal dining, office with built in desk and gun cabinet can double as 4th bedroom. Dreamy master suite boasts vaulted/beamed ceiling, bath with Jacuzzi tub, double vanity and walk in shower. 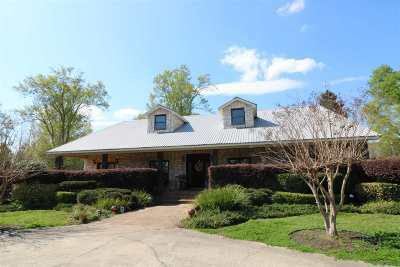 All this sitting on 6 beautiful white fenced acres of pasture land surrounded by wooded barrier for privacy. Paved driveway, secured by decorative electric gate, 25 KW generator and 4 car carport.